Saline solution for intravenous infusion. The white port at the base of the bag is where additives can be injected with a hypodermic needle. The port with the blue cover is where the bag is spiked with an infusion set. Saline solution for irrigation. This solution is used for irrigating wounds, tissues, body cavities, and bladders. Saline solution for irrigation should not be administered intravenously. In medicine, saline (also saline solution) is a solution of sodium chloride (NaCl, table salt) in water. It is used to flush wounds and skin abrasions, as eye drops, for intravenous infusion, rinsing contact lenses, nasal irrigation, and a variety of other purposes. Concentrations of salt vary from low to normal to high. High concentrations are used rarely in medicine but frequently in molecular biology. For parenteral (intravenous) application and tissue irrigation, most commonly used is sterile normal saline, containing 9.0 g of salt per liter (0.90%). Concentrations vary from low to normal to high. High concentrations are used rarely in medicine but frequently in molecular biology. Normal saline (NSS, NS or N/S) is the commonly used phrase for a solution of 0.90% w/v of NaCl, 308 mOsm/L or 9.0 g per liter. Less commonly, this solution is referred to as physiological saline or isotonic saline (because it closely approximates isotonic, that is, physiologically normal, solution); although neither of those names is technically accurate (because normal saline is not exactly like blood serum), they convey the practical effect usually seen: good fluid balance with minimal hypotonicity or hypertonicity. NS is used frequently in intravenous drips (IVs) for patients who cannot take fluids orally and have developed or are in danger of developing dehydration or hypovolemia. NS is also used for aseptic purpose. NS is typically the first fluid used when hypovolemia is severe enough to threaten the adequacy of blood circulation, and has long been believed to be the safest fluid to give quickly in large volumes. However, it is now known that rapid infusion of NS can cause metabolic acidosis. The solution is 9 grams of sodium chloride (NaCl) dissolved in water, to a total volume of 1000 ml (weight per unit volume(w/v)). The mass of 1 millilitre of normal saline is 1.0046 gram at 22 °C. The molecular weight of sodium chloride is approximately 58.5 grams per mole, so 58.5 grams of sodium chloride equals 1 mole. Since normal saline contains 9 grams of NaCl, the concentration is 9 grams per liter divided by 58.5 grams per mole, or 0.154 mole per liter. Since NaCl dissociates into two ions – sodium and chloride – 1 molar NaCl is 2 osmolar. Thus, NS contains 154 mEq/L of Na+ and Cl−. It has a slightly higher degree of osmolarity (i.e. more solute per litre) than blood (However, if you take into account the osmotic coefficient, a correction for non-ideal solutions, then the saline solution is much closer to isotonic. Osmotic coefficient of NaCl is about 0.93; therefore 0.154 × 1000 × 2 × .93 = 286.44) Nonetheless, the osmolarity of normal saline is a close approximation to the osmolarity of NaCl in blood. For medical purposes, saline is often used to flush wounds and skin abrasions. Normal saline will not burn or sting when applied. Saline is also used in I.V. therapy, intravenously supplying extra water to rehydrate patients or supplying the daily water and salt needs ("maintenance" needs) of a patient who is unable to take them by mouth. Because infusing a solution of low osmolality can cause problems such as hemolysis, intravenous solutions with reduced saline concentrations typically have dextrose (glucose) added to maintain a safe osmolality while providing less sodium chloride. As the molecular weight (MW) of dextrose is greater, this has the same osmolality as normal saline despite having less sodium. The amount of normal saline infused depends largely on the needs of the patient (e.g. ongoing diarrhea or heart failure). Saline was also used for the electric chair. Before the headpiece was strapped down to the victim, a small sponge soaked in the contents would be placed on the victim's head. Saline is also often used for nasal washes to relieve some of the symptoms of the common cold. The solution exerts a softening and loosening influence on the mucus to make it easier to wash out and clear the nasal passages for both babies and adults. In this case "home-made" saline may be used: this is made by dissolving approximately half a teaspoon of table salt into 240ml (approx. 8 ounces) of clean tap water. In very rare instances, amoeba Naegleria fowleri infection can occur if amoeba enters the body through the nose, therefore water used for nasal irrigation should be sterile. Eye drops are saline-containing drops used on the eye. Depending on the condition being treated, they may contain steroids, antihistamines, sympathomimetics, beta receptor blockers, parasympathomimetics, parasympatholytics, prostaglandins, non-steroidal anti-inflammatory drugs (NSAIDs) or topical anesthetics. Eye drops sometimes do not have medications in them and are only lubricating and tear-replacing solutions. Syringe designed saline drops (e.g. Wallace Cameron Ultra Saline Minipod) are distributed in modern needle-exchange programmes as drugs efficiently can be administrated either by injection, or ophthalmic, which is compared to intravenous use; By demonstration, the elimination of latanoprost acid from plasma is rapid (half-life 17 minutes) after either ophthalmic or intravenous administration. However, ophthalmic use is done with sterile filtered drugs that is potent in quite small doses, and with adjusted acidity of pH 7.0-7.5 after the drug has been added, to avoid eye damage. The human eye has a pH of approximately 7.5, water has 7.0. Hypertonic saline — 7% NaCl solutions are considered mucoactive agents and thus are used to hydrate thick secretions (mucus) in order to make it easier to cough up and out (expectorate). 3% hypertonic saline solutions are also used in critical care settings, acutely increased intracranial pressure, or severe hyponatremia. Inhalation of hypertonic saline has also been shown to help in other respiratory problems, specifically bronchiolitis. Hypertonic saline is currently recommended by the Cystic Fibrosis Foundation as a primary part of a cystic fibrosis treatment regimen. Aerosol — Nebulized hypertonic saline treatments disrupt the interaction between glycosaminoglycans and IL-8, rendering IL-8 susceptible to proteolytic degradation with subsequent decrease in neutrophil chemotaxis; all of this ultimately reducing inflammation. 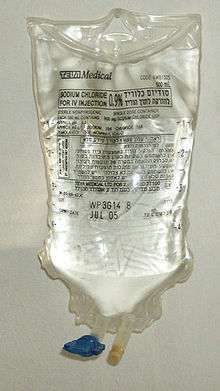 Half-normal saline (0.45% NaCl), often with "D5" (5% dextrose), contains 77 mEq/L of Na and Cl and 50 g/L dextrose. Quarter-normal saline (0.22% NaCl) has 39 mEq/L of Na and Cl and almost always contains 5% dextrose for osmolality reasons. It can be used alone in Neonatal Intensive Care Units. 3% NaCl has 513 mEq/L of Na and Cl. 5% NaCl has 856 mEq/L of Na and Cl. NaCl solutions that are less commonly used are 7% (1200 mEq/L) and 23.4% (approx 4000 mEq/L), both of which are used (also via central line), often in conjunction with supplementary diuretics, in the treatment of traumatic brain injury. Dextrose (glucose) 4% in 0.18% saline is used sometimes for maintenance replacement. Saline was believed to have originated during the Indian Blue Cholera pandemic that swept across Europe in 1831. William Brooke O'Shaughnessy, a recent graduate of Edinburgh Medical School, proposed in an article to medical journal The Lancet to inject cholera patients with highly oxygenated salts to treat the "universal stagnation of the venous system and rapid cessation of arterialisation of the blood" seen in severely dehydrated cholera patients. He found his treatment harmless in dogs, and his proposal was soon adopted by the physician Thomas Latta in treating cholera patients to beneficial effect. In the following decades, variations and alternatives to Latta's solution were tested and used in treating cholera patients. These solutions contained a range of concentrations of sodium, chloride, potassium, carbonate, phosphate, and hydroxide. The breakthrough in achieving physiological concentrations was accomplished by Sydney Ringer in the early 1880s, when he determined the optimal salt concentrations to maintain the contractility of frog heart muscle tissue. Normal saline is considered a descendant of the pre-Ringer solutions, as Ringer's findings were not adopted and widely used until decades later. The term "normal saline" itself appears to have little historical basis, except for studies done in 1882-83 by Dutch physiologist Hartog Jacob Hamburger; these in vitro studies of red cell lysis suggested incorrectly that 0.9% was the concentration of salt in human blood (rather than 0.6%, the true concentration). ↑ Prough, DS; Bidani, A (1999). "Hyperchloremic metabolic acidosis is a predictable consequence of intraoperative infusion of 0.9% saline". Anesthesiology. 90 (5): 1247–1249. doi:10.1097/00000542-199905000-00003. PMID 10319767. ↑ Fluid Density Calculator. Earthwardconsulting.com. Retrieved on 2011-02-27. ↑ Water Density Calculator. Csgnetwork.com. Retrieved on 2011-02-27. ↑ What does saline nasal spray do? ↑ "Latanoprost Drug Information, Professional". Drugs.com. Retrieved 2012-05-14. ↑ "pH Value Eye Drops". Clear-lenses.com. 2004-08-22. Retrieved 2012-05-14. ↑ Principi T, Komar L (2011). "A critical review of "a randomized trial of nebulized 3% hypertonic saline with epinephrine in the treatment of acute bronchiolitis in the emergency department."". J Popul Ther Clin Pharmacol. 18 (2): e273–4. PMID 21633141. ↑ O'Connell OJ, O'Farrell C, Harrison MJ, Eustace JA, Henry MT, Plant BJ (2011). "Nebulized hypertonic saline via positive expiratory pressure versus via jet nebulizer in patients with severe cystic fibrosis". Respir Care. 56 (6): 771–5. doi:10.4187/respcare.00866. PMID 21333079. ↑ Jones, Alonzo. "Intranasal Xylitol, Recurrent Otitis Media, and Asthma: Report of Three Cases*". Nasal xylitol, from Clinical Practice of Alternative Medicine. Alonzo H. Jones, DO. Retrieved 7 May 2014. ↑ Access. Medscape. Retrieved on 2011-02-27. ↑ O'Shaugnessy, WB (1831). "Proposal for a new method of treating the blue epidemic cholera by the injection of highly-oxygenated salts into the venous system". Lancet. 17 (432): 366–71. doi:10.1016/S0140-6736(02)94163-2. ↑ Kenneth M Sutin; Marino, Paul L. (2007). "The ICU book". Hagerstwon, MD: Lippincott Williams & Wilkins. ISBN 0-7817-4802-X. ↑ Awad, Sherif; Allison Simon P; Lobo Dileep N (2008). "The history of 0.9% saline". Clinical nutrition (Edinburgh, Scotland). 27 (2): 179–88. doi:10.1016/j.clnu.2008.01.008. PMID 18313809.